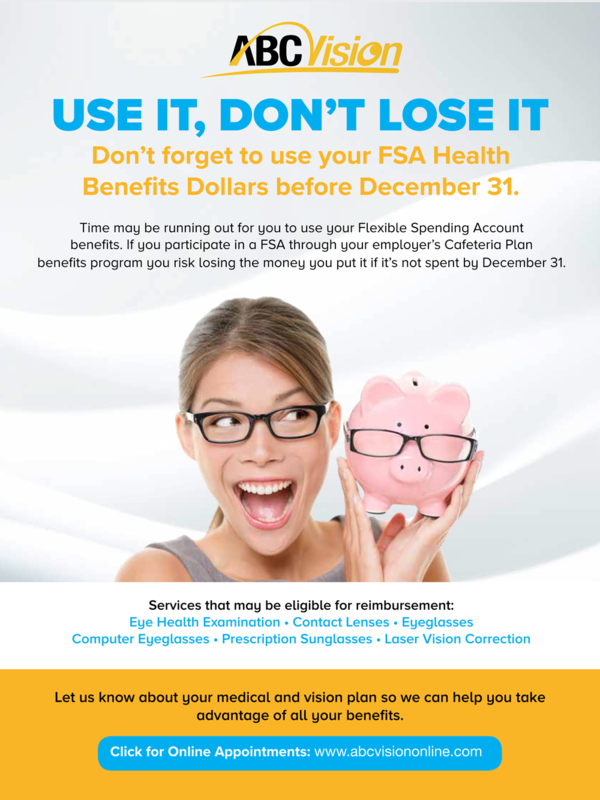 Flexible Spending Accounts are a great resource for eye exams, new glasses, contacts, or sunglasses! Use them, don't use them. Welcome to ABC VISION. The ABC VISION team strive to provide the best in optometry services. We invite you to browse our website to learn more about our optometry services and join our patient family by scheduling an eye exam appointment at our office. ABC VISION is a full service eye and vision care provider, accepting both eye emergencies as well as scheduled appointments. Patients throughout the Portland Metro area come to ABC VISION because they know they will receive the personal attention and professional care that is our foundation. Our team are dedicated to keeping our patients comfortable and well-informed at all times. At ABC VISION, we will explain every exam and procedure and answer all of our patients' questions. Additionally, at ABC VISION, we offer vision financing options and will work with vision insurance providers to ensure good eye health and vision care for all of our patients. Our one-on-one approach to optometry makes the ABC VISION staff the eye and vision care providers of choice in the Portland Metro area. Our Portland Metro area optometrist offers the following services: complete eye exams, contact lenses, glasses, glaucoma testing, and pre- and post-operative care. For a complete list of services, visit our services page or call our Portland Metro area office at (503) 473-8039. At ABC VISION, we are dedicated to providing high-quality optometry services in a comfortable environment. Call us at (503) 473-8039 or schedule an appointment today online. Dr. Ward is the President of ABC Vision and graduated from Pacific University College of Optometry in 1993 plus completed a hospital residency in ocular disease and geriatrics. In 1997 she became an adjunct clinical faculty member of Pacific University College of Optometry. Dr. Rachel Murphy hailed from Jackson Hole. She loves dressage and from this learned the benefits of hard work and accuracy. She did her undergraduate studies in Biology at Berry College in Mount Berry GA.
Joe has excelled his way through every aspect of the optical field. His extensive experience began in 1971. After completing his military service, Joe learned every facet of the optical business beginning with the manufacturing of contact lenses, the bench work aspect of glass fabrication and the art of optical dispensing. Angie joined ABC Vision Source in January 2013. She received her Medical Insurance Billing and Coding Diploma from Everest Institute and has her National Certification. Angie is a native of Forest Grove Oregon and fluent in Spanish. Angie loves to spend her free time with her son and husband plus ride ATV’s in and around the coastal range. Angie oversees all our billing and coding for all ABC location. One man in each century is given the power to control the electromagnetic spectrum of light. The man chosen to receive this power is carefully selected. He must be kind. He must be fair. He must be brave. He must love rat pack music and come from Wyoming. Plus he must know everything about optical lenses. This man is Ryan Murphy, Laboratory Manager. Emylee is an Oregon native and proud of it. She is also proud of her Philippine heritage. She is an ambitious individual and excellent optician. In her free time, Emylee enjoys the wonderful Oregon coast and long walks on the beach. She is our classical 90’s R&B fan and will always take time to help you find the best eyewear for your lifestyle. Born and raised in Oakland, California. Arrianna is the mother of five beautiful children. Her daughter Catherine also works at ABC Vision; we are a family company. She has three amazing grandchildren with another one on the way. She loves to go on adventures with camera in hand, look at this website for her wonderful photography. Michael was born in Santa Monica CA and raised in Santa Ann CA. Mr. Hester graduated from Fresno State University and has an MBA from the University of Idaho. "Dr Mari Ward is the best of the best. Her office in Sherwood no one can compare. They're all helpful, funny and the nicest people you ever want to work with. I've been so happy with them I drive the 30 minutes. I've been going to them for five, six years now. Don't plan on taking my business any wherever else." "The best experience I've ever had shopping for glasses! They really helped steer me to frames that truly fit me. And looked deep into my vision benefits--I paid half of what I thought I was going to!"